With a few top players driving the global smart glass market, the market features a consolidated competitive landscape, says a new report by Transparency Market Research (TMR). The top players, namely ASAHI GLASS, DuPont, Saint-Gobain, and Guardian Industries held a share of 40% in the global market in 2015. However, the degree of competition is expected to rise as players focus on strengthening their position with strategic alliances and mergers and acquisitions. TMR estimates that the global smart glass market is expected to display a CAGR of 14.50% between 2016 and 2024. As a result, the market’s valuation will reach US$7.04 bn by 2024 increasing from US$2.10 bn in 2015. In terms of end user, architecture, transportation, consumer electronics, and solar power generation are the segments of this market. Of these, transportation displays the leading demand for smart glass and the scenario is expected to remain same until the end of the forecast period in 2024. This is due to the increasing application of smart glass in automobiles for sun roofs, sun visors, and side and rear windows in high-end cars. At present, the flourishing aviation and automotive industries are also expected to fuel the demand for smart glass in the transportation sector. The architecture and consumer electronics segments also display substantial demand for smart glass and are expected to continue do so over the coming years. 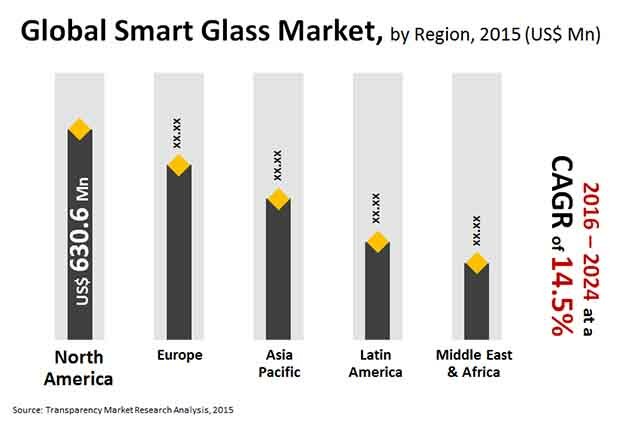 In terms of geography, the worldwide smart glass market is spread across North America, Asia Pacific, Latin America, the Middle East and Africa, and Europe. North America leads the global market and is expected to continue doing so in the near future. In this region, the increasing prominence of renewable energy, particularly solar energy, as a measure to ensure energy security in the long-run is driving the smart glass market. As smart glass is important for the generation of solar energy, increasing initiatives for harnessing solar power to convert into energy will display an increased demand for smart glass. The region is closely followed by Europe and Asia Pacific in terms of growth of smart glass market. At present, the smart glass market in Asia Pacific is relatively new; however, the market holds immense potential for solar power generation due to the abundance of solar energy in countries that are close to the Equator. Moreover, in countries such as China and India, improving economic conditions leading to the development of the housing sector will display the demand for solar panels, which in turn, will benefit the smart glass market. Across the world, depleting sources of energy have raised alarms among governments to implement regulations to reduce the consumption of energy. The development of green buildings fitted with smart glass is one of the prominent initiatives taken for energy conservation by governments across several developed countries. This is because smart glass plays a key role in saving energy that can be used for heating, cooling, or illumination purposes. With the increasing development of green buildings across several large cities of the world, the smart glass market is expected to be benefitted. However, high cost factor of smart glass and the easy availability of substitutes may challenge the growth of this market to some extent, states the report.